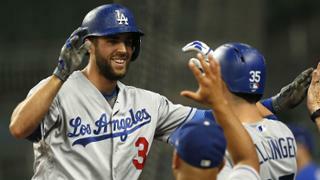 Chris Taylor went 3-5 with three runs scored and a two-run home run, leading the Dodgers to a 7-4 victory over the Braves. Alex Wood was not as sharp as he has been in earlier games but he kept the Braves quiet, pitching six innings of one-run ball. Austin Barnes reached base four times in the win. Alex Wood was not fooling as many batters as he usually does, he allowed seven hits and two walks, but he was much better than his last start against the Braves. When Wood’s former team came to Los Angeles, Wood was charged with nine runs, his worst start of the year. This time, all though his velocity was down and his breaking balls weren’t sharp, he held the Braves to one run over six innings. He collected a quality start and a win. The Dodgers’ offense atoned for Wednesday (when they scored only three runs in a loss), by scoring seven runs during last night’s game. Chris Taylor led the charge by going 3-5 with three runs scored and a two-run home run. Austin Barnes reached base four times, he walked twice, got hit by a pitch, and hit an RBI double.After 4.2 innings, the Dodgers had scored three runs on four hits with seven walks against Atlanta’s starter Sean Newcomb. The Dodgers started their attack on the Braves in the third inning, but it did not stop there. With the Dodgers trailing 1-0, Taylor and Corey Seager led off with back-to-back singles, then Newcomb walked Justin Turner, loading the bases for the second straight inning. Newcomb then struck out Cody Bellinger (0-5 with two strikeouts), before issuing a walk to Logan Forsythe to tie the game. The Dodgers were not content to tie the game so they resumed scoring in the fourth inning. Yasiel Puig led off with a walk, then Wood bunted him to second base. Chris Taylor then came to the plate and hit a fastball over the wall in straight away center field. The ball traveled just over 400 feet and it gave the Dodgers a 3-1 lead. Taylor continued to help his team in the sixth inning. With one out, Taylor singled, then advanced to second on a wild pitch. He then went to third when Seager singled. That brought Turner to the plate. Turner got a high fastball and he lifted it into right-center field. Ender Inciarte made the catch at the edge of the warning track. Taylor tagged up and score, extending the Dodgers’ lead to 4-1. The Dodgers added two more runs in the seventh inning and here’s how it happened. Forsythe led off with a single, then Barnes was hit by a pitch. Kiké Hernández then singled to right field, scoring Forsythe and sending Barnes to third. The Dodgers lead was extended to 5-1. Puig then decided that he wanted the Dodgers to score another run, but he did not want an RBI. So what did he do? He grounded into a double play, allowing Barnes to score and make it a 6-1 Dodgers lead. Each team scored in the ninth inning. The Dodgers scored when Barnes hit an RBI double into the right-center field gap. Logan Forsythe scored from first and the Dodgers extended their lead to 7-1. The Braves scored in the bottom of the ninth, forcing Tony Cingrani to make a very bad first impression. Without recording any outs, Cingrani gave up back-to-back singles, then Ozzie Albies came to the plate. Albies was in his third Big League game and had not yet collected a hit. This all changed, however, when Cingrani threw a fastball over the plate. Albies hit it over the wall in the left-center field gap for his first Big League hit and first home run. The final score of the game was 7-4. Sean Newcomb’s control issues in the third inning carried over into the fourth. After getting himself into a lot of trouble in the third inning, Newcomb issued a lead off walk to Puig. Two batters later, Chris Taylor jumped on an elevated fastball. While Newcomb admitted after the game that he wasn’t being aggressive on the pitch, Taylor said afterwards that in a hitters count, he wanted to be aggressive. The Braves had Alex Wood walking a tightrope in the fifth inning with the bases loaded and no outs. Albies was at third base, Lane Adams was at second, and Inciarte was at first. Austin Barnes and Logan Forsythe went to the mound to talk to Alex Wood and the thought of a possible pickoff attempt entered Adams’ mind. He left his guard down and the Dodgers took advantage. Wood spun around and fired the ball to second base. Forsythe applied the tag and Adams was called out. After thinking about the player of the game, I decided to that it would go to Chris Taylor. Once again, if you disagree I would love to hear why. Please comment below on your opinion for the player of the game. My reason for picking Chris Taylor is simple. He went 3-5 with three runs scored and a two-run home run. Taylor’s home run is what really started the Dodgers’ offense, and if he hadn’t reached base three times, the Dodgers would have only scored four runs, not seven. Taylor is one of those amazing players who just slips under the radar. I don’t know about Yu but I’m really excited for the series opener in New York. Okay, that was a really bad pun but I couldn’t resist. Yu Darvish will take the mound for the Dodgers in the series opener against the Mets and Jacob DeGrom will pitch for the Mets. Darvish was acquired by the Dodgers at the trade deadline and he will be making his first start as a Dodger. DeGrom has a record of 12-4 with an ERA of 3.29 this year. The game will start at 4:10 pm PT and be televised on SportsNet LA.